Materials: soap, driftwood, steel, porcelain, cotton rag, water. Soap ingredients: James River water and mud, Hog Haven Farm and Sno-Cap lard, Reedy Creek Apiary beeswax, acorn oil, honeysuckle, dandelions, redbud flowers, violets, crabapple blossoms, paw paw flowers, grass, buttercup, vetch flowers, river birch pollen, eastern cottonwood pollen. All at once, our rivers are dirty and clean, dangerous and beloved, natural and unnatural, wild and controlled. Making soap from materials gathered from a river is a way to confirm these complex relationships. 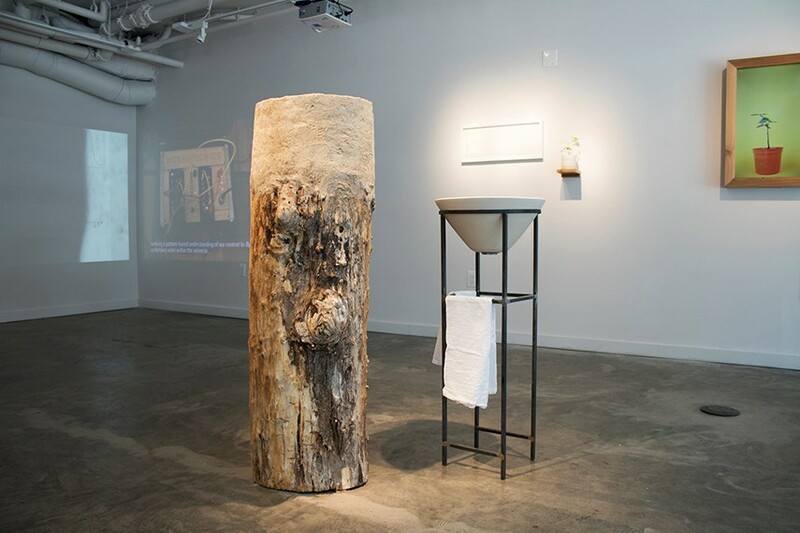 The James River Soap Wash Station was created for the exhibit EnterState: Sensing the Natural World at Washington Project for the Arts. The soap station consists of a piece of river driftwood topped with forty pounds of soap made from James River water, local lard, mud, and foraged riparian plants. 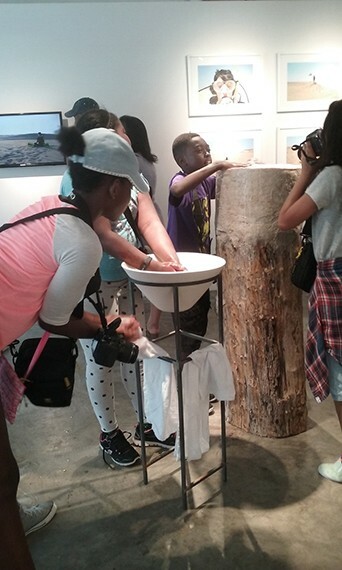 Visitors to the gallery were invited to wash their hands in the river using a porcelain and steel water basin. A zine called “RIVER SOAP: a how-to guide” accompanied the piece. It contains detailed instructions for making a place-based soap in addition to information about the greater Chesapeake Bay Watershed and everyday ways to care for it. The guide was compiled to encourage others to directly engage with their environments through the process of making soap. By combining an educated awareness of watershed issues with traditional skills, the goal is to promote a deeper human connection between material, place, body, and the natural world. Learn how to forage and dry plants, source local fats and oil, render animal fat, press oil from acorns, make hot process soap, and improve the health of the watershed. In conjunction with the show, I gave a soap making workshop using water and materials sourced from the Anacostia River in DC. The Anacostia has been historically neglected and polluted. With the efforts of citizen scientists, naturalists, and activists, it is now undergoing restoration. The workshop was part demonstration and part environmental performance. Participants left with a new practical skill, but also gained a new awareness of the physical material of their urban environment and the issues surrounding it in the form of river water, fat, dirt, and plants. By combining an educated awareness of environmental issues with traditional skills, the goal is to promote a deeper human connection between material, place, body, and the natural world through public engagement and installation.